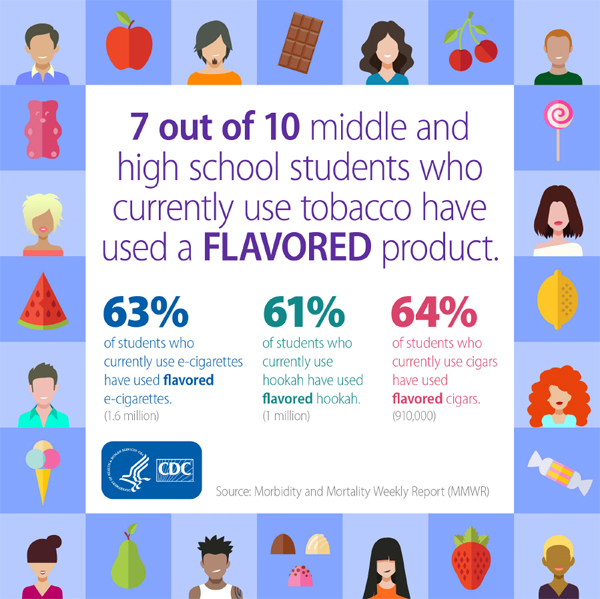 7 out of 10 middle and high school students and who currently use tobacco have used a flavored product. An estimated 70 percent of U.S. middle and high school students who have used a tobacco product in the past 30 days have used at least one flavored tobacco product during this period, according to a study published by the Centers for Disease Control and Prevention (CDC) and the Food and Drug Administration (FDA) in today’s Morbidity and Mortality Weekly Report (MMWR). Data from the 2014 National Youth Tobacco Survey (NYTS) show that among students who used each of the following tobacco products in the past 30 days (defined as current users), 63.3 percent (1.58 million) had used a flavored e-cigarette, 60.6 percent (1.02 million) had used flavored hookah tobacco, 63.5 percent (910,000) had used a flavored cigar, 58.8 percent (690,000) had used flavored smokeless tobacco, 53.6 percent (900,000) had used menthol cigarettes, and 42.3 percent (120,000) had used flavored tobacco in pipes. About 18 percent of all high school students reported using at least one flavored product in the past 30 days; 5.8 percent reported using only non-flavored tobacco products. E-cigarettes (8.8 percent) were the most commonly used flavored tobacco product among high school students, followed by hookah (6.0 percent), cigars (5.3 percent), menthol cigarettes (5.0 percent), any smokeless tobacco (4.1 percent), and tobacco in pipes (0.7 percent). Among students who currently use tobacco, a higher proportion of high school than middle school students reported use of flavored e-cigarettes, flavored hookah, flavored smokeless tobacco, and any flavored product, while the proportion of male and female users who reported flavored product use was generally similar. Among students who currently smoke cigarettes, a greater proportion of non-Hispanic blacks reported menthol cigarette use (70.5 percent) than non-Hispanic whites (51.4 percent) and Hispanics (52.3 percent). Among those who used other tobacco products in the past 30 days, non-Hispanic blacks generally had lower prevalence of flavored product use than non-Hispanic whites. Sustained efforts to implement proven tobacco control programs and policies are necessary to prevent all forms of tobacco use, including use of flavored tobacco products, among U.S. youth. For example, several local jurisdictions, including New York City, Chicago, Providence (Rhode Island), and Santa Clara (California), have acted to limit or restrict sales of flavored tobacco products in these communities. Additional strategies to reduce youth tobacco use include increasing the price of tobacco products, adopting comprehensive smoke-free laws, implementing national public education media campaigns, and raising the minimum age of purchase for all tobacco products to age 21.